2010 Kawasaki Bayou 250. Picture credits - Kawasaki. Submit more pictures. 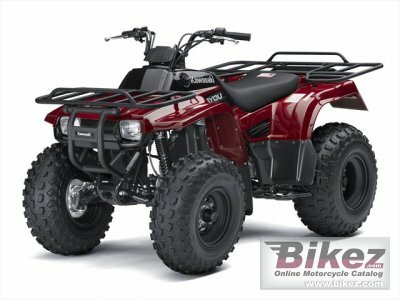 Rugged and economical, Kawasaki�s Bayou� 250 ATV personifies the old adage, �great things come in small packages.� Equipped with a long-lasting, electric-start four-stroke engine, five-speed transmission with reverse and steel cargo racks, the Bayou 250 is synonymous with four wheel value. Price as new (MSRP): US$ 3799. Prices depend on country, taxes, accessories, etc. Front suspension: Single A-arm, independent / 4.5 in. Rear suspension: Semi-independent Quad-Link with dual shocks / 4.9 in. Comments: Five-speed-plus reverse with automatic clutch. Ask questions Join the 10 Kawasaki Bayou 250 discussion group or the general Kawasaki discussion group. Bikez has discussion forums for every bike. View comments, questions and answers at the 2010 Kawasaki Bayou 250 discussion group. You can sign up for e-mail notifications when other riders answer you. If you have extensive experience with the MC, please send us a review. If you consider buying this bike, you should view the list of related motorbikes Look at photos. Compare technical specs. And check out the rating of the bike's engine performance, reliability, repair costs, etc. You can compare the rating with other bikes.